Recommended for meditation, tantra, yoga Silence of Light is the ideal companion to Tantra and love-making. Optimism returns. Symptoms of anxiety recede. This is perfect background music for meditation and yoga. Silence of Light connects heaven and earth, allowing the mind to link with the spiritual universe; the alpha stratosphere. Following on from Silence of Vision, it allows you to fly high, while being fully grounded to the earth. When I am listening to Silence of Light I am filled with hope. It feels like waking up fully refreshed and happy to face the new day after a long night’s sleep. It feels like I have sunshine on my face. I have one client, a lady who is very stressed person, and the only time when she is completely relaxed is whenever I play John’s Alphamusic to her. Her life is composed of hurting and she tends to go round and round in the same circle of the same things without really ever moving on. She has been coming to me for a long time and I have been trying to help her with the various different things. At the beginning of the session she was hyper anxious, worried and with the tunes of John’s Alphamusic, she managed to calm down and she completely chilled out in the end of that session. 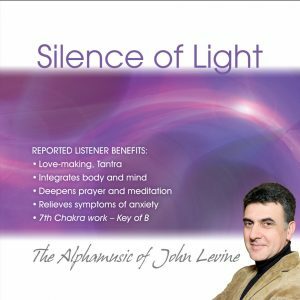 John Levine writes music that builds a Body/Mind Connection. And he does it so well! His music speaks with such gentle compassion that I am yet to hear from any other composer. As a Shiatsu Therapist I need to create a nurturing and comfortable healing space for my clients. Since I began to use his music in 2006, I feel that my treatments became more effective as it allows for greater relaxation and ultimately a greater sense of body awareness.